For many of us, summer just isn’t summer without corn on the cob. From family barbecues to Fourth of July parties, you’ll find it hard to avoid this tasty golden veggie, and for good reason—it’s super easy to prepare and delicious. Never made it before? Sit back and relax—cooking corn on the cob is way easier than it seems. Here’s everything you need to know before you make it! The ear method: Feel the end of an ear of corn. If it’s rounded or blunt, the corn is ready. If it’s pointy, it’s not quite ripe yet. The eye method: It’s easy to tell if corn is ripe by taking a quick peek at the kernels. Pull back a bit of the husk and look to see if the ear is well-filled and the kernels are colored creamy yellow or white. Don’t pull the husk back too far—it’s a protective covering and should stay on until you’re ready to cook the corn. The fingernail method: You can also pierce a kernel with your nail to test for ripeness. If the liquid inside is watery, it’s not ready yet. If it’s white or milky-colored, the corn is ripe and ready. Once you’re ready to cook your ears of corn, you’ll need to shuck them. Corn has two parts to its natural protective covering: the husk and the silk. The husk is that greenish, papery outer part and the silk is the soft and stringy layer behind the husk. Both the husk and the silk need to be removed before the corn can be consumed. The process of removing these two pieces is called shucking, and it’s super easy – easy enough that you can even have the kids help! Here’s how to do it. First, peel back the husk leaves one at a time until only a thin layer of leaves remain around the corn. Make sure the brownish “tassel” at the end of the cob holding the silk layer together stays intact. Next, grab the tassel along with the tops of the last layer of leaves and pull down. Depending on how you plan to prepare your corn on the cob, remove all of the silk and fold the husk leaves back, or remove them completely by snapping them off the base of the cob. Expert tip: Shucking can be a messy business. Use a damp paper towel to wipe the corn and get rid of any remaining silk threads. To minimize cleanup, shuck the corn over a plastic or paper bag. Once all of your corn has been shucked, it’s time to get cooking. From the stovetop to the microwave to the grill and even the oven, you can cook corn on the cob any way you like! We’ll walk you through our favorite ways to cook corn on the cob using any of these methods. One of the most popular ways to cook corn on the cob is to boil it on the stovetop. 5-quart saucepan, Dutch oven or large stockpot. First, heat water and salt to boiling in a 5-squart saucepan, Dutch oven or large stockpot. Add corn and cook uncovered for 5 to 7 minutes or until heated through. Remove corn from the water and serve immediately. For a fun flavor twist, spread corn with butter and sprinkle with salt or freshly chopped herbs. To cook corn on the cob in the microwave, you can leave the husk on, or shuck the corn and wrap each ear in wax paper. Microwave one or two ears at a time on high for 3 to 6 minutes. Allow the corn to cool for a few minutes before serving. You can grill corn on the cob with or without husks. Both ways are delicious; it’s just a matter of which method you prefer. When you grill corn on the cob with husks, the husks naturally protect the corn from direct heat and also lend a nice smoky flavor to the corn itself. But some prefer to grill corn on the cob without husks to char the kernels. Expert tip: If you want to remove the husks but keep the corn protected from direct heat – or add butter to the corn before grilling – you can wrap the corn on the cob in foil before placing it on the grill. In this grilled corn recipe, leaving the husks on protects the kernels from the grill’s direct heat. For best results, brush the corn with herb-flecked butter while it’s still warm. 1. In a small bowl, mix butter, chives, basil and oregano. Cover and refrigerate until ready to serve. 2. Heat a gas or charcoal grill. Remove all but innermost husks from corn. Fold back inner husks. Remove corn silk, then rewrap husks around corn. Grill corn over medium heat, covered, 10 to 15 minutes until corn is tender and husks are slightly brown. Serve immediately with herb butter. Expert tip: Use an oven mitt to remove hot husks from just-grilled corn before serving. One of our favorite recipes for grilling corn on the cob without husks uses Mexican street corn-inspired flavors. 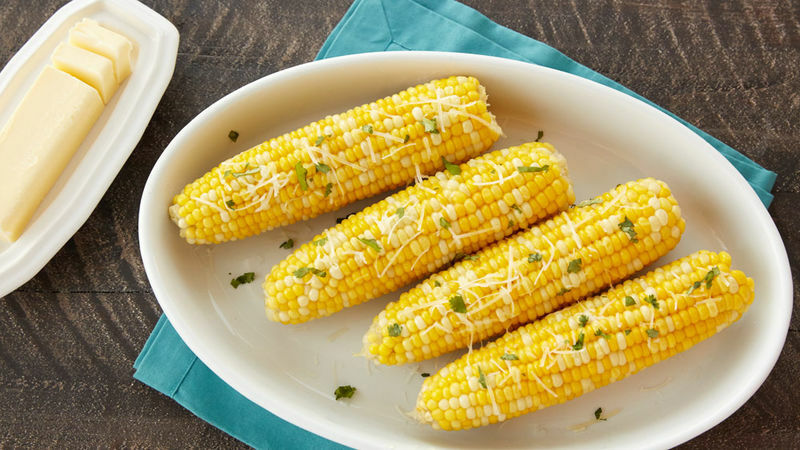 The char from the grill’s direct heat on the corn is a perfect complement to the seasoned mayonnaise and crumbled Mexican cheese. 1. Heat a gas or charcoal grill to medium-high heat. Carefully brush grill grates with vegetable oil. 2. Place corn directly on grill. Cover and cook 8 to 10 minutes, turning occasionally, until lightly browned on all sides. 3. Brush cooked corn with mayonnaise; sprinkle with taco seasoning and cheese. Serve immediately with cilantro sprinkled on top. Steaming corn on the cob is a simple way to cook corn and, like boiling frozen corn on the cob, it requires just two ingredients: corn and water. Remove the husks and silk from up to 3 ears of corn; depending on the size of your steamer basket, you may need to cut the ears in half to fit. Add 2 inches of water to a large stockpot and insert a steamer basket (make sure the water is not touching the bottom of the steamer rack and if it is, pour off some of the water). Cover the pot and bring the water to a boil over high heat. Once the water is boiling, use cooking tongs to add the corn to the steamer basket. Cover the pot and let the corn steam anywhere from 4 to 15 minutes. The longer you steam the corn, the softer it will be. Skip the big pots of boiling water and cook corn on the cob in the oven! It’s an unusual but easy method that yields impressive results. 1. Heat oven to 400°F. Place corn in ungreased 13x9-inch (3-quart) glass baking dish. Add enough water to reach 1/2-inch up sides of corn. Cover dish tightly with foil. Bake 30 minutes. 2. While corn cooks, in a small bowl, mix parsley, butter and seasoned salt. 3. Drain corn. Pour butter mixture over corn; turn corn to coat. Serve immediately. You can cook frozen corn on the cob in a variety of ways, but the easiest way is to boil it. Place up to 6 ears of frozen corn in a large stockpot and cover with cold water. Over high heat, bring the water to a boil. Reduce the heat to low and cover the pot; cook the corn for 5 to 8 minutes until tender. With cooking tongs, remove the corn from the water and place on a plate. There are so many delicious ways to serve corn on the cob. Simply spreading butter and herbs on top is a tasty, classic way to eat it, but you can also add seasonings and toppings like grated Parmesan cheese, onion, taco seasoning, curry powder or chili sauce. Now that you know how to cook corn on the cob, we have a few more tips to help get you the tastiest possible ears of corn to your table. When seasoning corn on the cob, it’s best to combine spices with butter – that way, you can brush on the seasonings evenly and they’ll stick to the kernels. You can use just about any spice you love, but you can also keep it as simple as adding salt and pepper. Overcooking is a common reason for tough corn on the cob. There’s not much you can do to remedy overcooked corn, but you can take care to make sure it doesn’t happen in the first place. When boiling corn, be sure to remove the corn from the water as soon as the allotted time has passed. Perfectly cooked corn on the cob will be bright yellow with tender, slightly crisp kernels. When feeding a crowd, it’s best to err on the side of preparing 1 large ear of corn, or 1 1/2 medium ears of corn, per person. Each large ear of corn yields about 3/4 cup of kernels. Corn is best eaten immediately when it’s fresh, but if you don’t eat all of it, it can be stored in the refrigerator still on the cob, covered for a day or two. You can also cut the kernels off and refrigerate in a tightly-sealed container. If you don’t want to eat your leftovers right away, you can freeze them too! All you need to do is remove the kernels and store them in a sealed and labeled freezer bag with as much air removed as possible. Use within a couple months. Expert tip: To easily cut kernels off of an ear of corn, hold the ear of corn vertically, stalk end-down, take a sharp knife and carefully cut off the kernels by cutting down the length of the cob. Get in all of your veggies with these easy + tasty recipes.